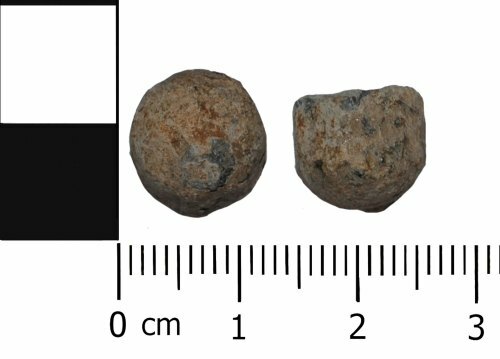 Lead alloy musket ball difficult to date with any accuracy they could be as early as 1600 AD or as late as 1840 AD. The ball is impacted on one edge indicating that it has been fired or rammed. The diameter is 12mm and the weight 7.43g. The weight of the shot suggests it may have been meant for firing from a pistol, small carbine or buckshot given the size (Harding, 2012, Lead Shot of the English Civil War: a Radical Study). Over 800 balls of roughly the same size and weight have been found over a period of twenty years indicating a possible skirmish site.